OK, I didn't see the show you are speaking about. But of course they are ok because they hate the white man. And; many of the MEChA people hate American Indians as well-------never mind that, racially speaking, most Mestizos are of White/Indian heritage. 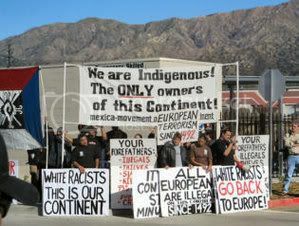 The former group would not last long in Spain either-------that variety of Hispanic is very White Supremacist. Funny; one does not see many of the MEChA style protests in Mexico. Besides; Mexico fought (and won) their war of independence from Spain ca. 1821, had the former lost--------connect the dots. 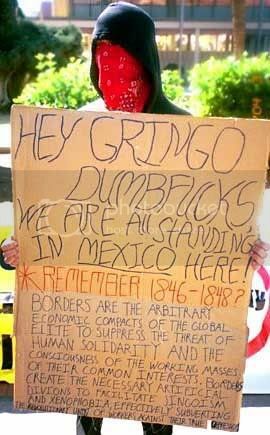 Too; where is the rage against Guatemala, etc.------they too were part of Mexico after 1848 but that fact is 'conveniently' overlooked. Like it or not, racism is part of human nature. Human nature is to most like "our own kind". Now, don't misunderstand, most people realize that blatant racism - that is, taking adverse actions against someone merely because of their race, is wrong. But, racism is there nonetheless. I happen to watch 20/20 last night. They did a segment on just this issue by chance. They took three white teenagers - and they were vandalizing a car. Spray painting it - breaking a window. All in an area with lots of passers by. Only 2 people called 911. Then, they put 3 Black teenagers - doing the very same thing. I think there was a dozen calls to 911. Racism. The Chinese (in China) do not like the Japanese. In the United States, there is racism expressed towards those of Middle Eastern heritage. Native Americans in our own country experience racism all the time. Racism is many times expressed by stereotyping a group because of the actions of One. I don't doubt this one bit....there is NO DOUBT at all that Black folks DO have a harder time with 'scrutiny" than others. I told the story on another post in which my wife (Indian) and her co-worker (black) one evening on their switchboard got a call form a "concerned lady" in the exclusive community that there was a black man walking up the street. He wasn't DOING anything, but the lady just wanted to be EXTRA CAREFUL. You can imagine the "conversation" my wife and her friend had after they "settled" THAT call. HOWEVER, this has to do with a subject no one YET has mentioned...and that's called "Stereotyping". It is as racist as anything could be, yet is almost impossible to 'root out"...and that is because there IS a tiny degree of validity in stereotyping...and that's why it 'hurts". For example, someone who automatically associates "Mexicans" with "illegals" is obviously making broad racist connections...YET, there is some BASIS for this stereotyping, since up to 20 million Mexicans in this country, ARE, in fact, here illegally. It isn't a WHOLLY irrational connection. And, if a person IS only a 'racist', this gives his grumblings more 'fuel'...that, in fact, the object of his dislike (in this case, Mexicans) really ARE doing 'wrong" things, and in great numbers. Stereotyping is what fuels the ENDLESS and montonous assertions that ANY "Anglo" who objects in ANY way to illegal immigration, is, by definition, a "racist". The stereotype continues to exist because, in fact, some of these people really ARE racists, and that fact is then used to label ALL anglo anti-ilegals as 'racists', though many have perfectly legitimate objections to illegals, for reasons having nothing to do with race. The same "stereotyping" goes on when folks see an adult male "lingering" around a kindergarten....or idly strolling through a parking structure where lone female employees park....or when large groups of kids dressed in "gang colors" walk into a shopping mall. Several convenience stores near here, next to High Schools, have signs prominently announcing "No More Than Two Students Allowed At Any Time". I understand their 'rationale', but that's stereotyping. Get 15 students in your store at once, and your troubles may be greater than any 'profits' you'd earn. (You're ALSO likely to lose other customers, during that 'lunch break'). Why do you suppose many landlords refuse to rent houses to groups of college students? (Hint--it's not because they object to education)..
Stereotypes exist and have their 'sting', because there is an uncomfortable rationale for their existence. There is no stereotype, for example, for "Amish gang-bangers", or "Swedish suicide bombers", or "elderly skateboarder punks", or "Biker gangs who dress in business suits", because either these groups DON'T EXIST, or their numbers are so tiny, that they have no impact on society. To say that the "cops" treat people in the 'inner city' differently than they treat people in the affluent suburbs is beyond argument...OBVIOUSLY, that is the case. But it's ALSO true that many people in the inner city treat the "Cops" differently than they're treated in more affluent areas, as well. Few remember this, but way back in the dark days of the Viet Nam years, just after the MANY college "sit-ins" at Berkeley and elsewhere (which went on so long that many students had their whole year's grades 'destroyed' by all the idle time), there was some sort of student uprising at a large university in Mexico City. The "feds" moved in, bargained with the protesters, ordered them off the property, and out of the admin offices. Many complied, and the 'standoff' continued, as the 'cops' made several ultimatums, which eventually were ignored. After about the 4th or 5th day (as I recall), that was 'it'. The Feds moved in, with LIVE AMMO, and a number of students were killed, gassed, and seriously injured. 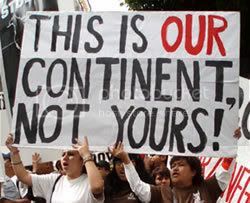 While America continued for years afterward with "student sit-ins" and various "occupations" of its campuses, Mexico never again experienced that sort of thing, to my knowledge. Doesn't ANYONE take encouragement from the fact that these MEChA signs are in ENGLISH?.....and YOU thought they didn't want to ASSIMILATE !! That as you described occurred in 1968------and, the ramifications are still be felt SOB. 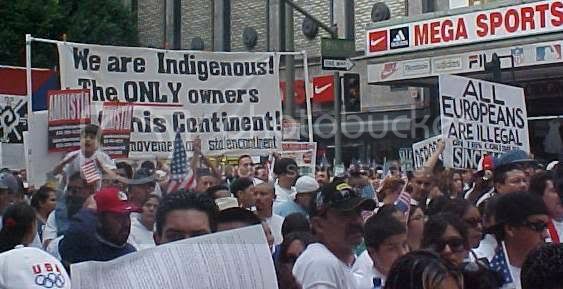 Although using Spanish would be almost as dumb-------the language of the White Spanish conquistadors who subjugated the indigenous peoples of the New World.